Orientation is a set of programmes designed to introduce first-year students to the different facilities and unique aspects of university life. It usually begins with parent orientation, where the parents of new students are invited to familiarise themselves with the university. Each faculty also runs its own orientation programme, as does the International Academic Programmes Office (IAPO). For students in residence, there is also a residence orientation programme. Faculty orientations include academic advice about courses and programmes, assessment tests and questionnaires, computer training, campus and library tours, as well as introductions to student services like the Careers Service, the Student Wellness Service and Agents of Change Education (ACEs) peer education programme. 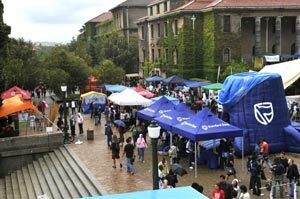 During Orientation Week or "O" Week the more than 80 student clubs and societies also showcase their activities and invite students to join. Programme information will be published on the website as soon as it becomes available.